Check this out! I stopped and talked to the old lady who owns this for about an hour and a half, and She said It had an owner in '65-'66 but he passed away. 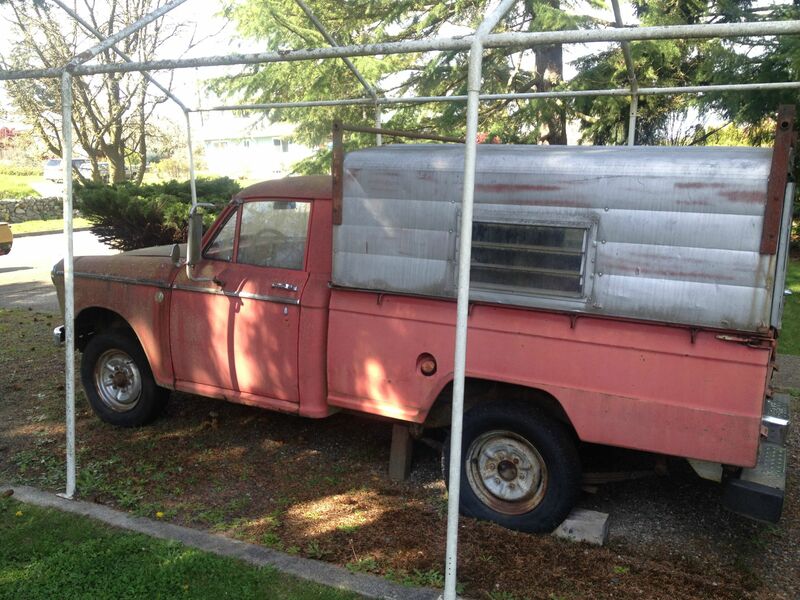 Then her father purchased it in1966 and drove it til '76(?) when he passed away. Soon after, her husband kept it in storage at the in Tacoma, WA for many years and driving til around 1988 when the fuel pump went out. Parked in storage in Tacoma til a few years back, then Finally bringing it home and then he just passed away last year. She said it needs to go to a loving home because there are too many precious memories with it. Her husband called it the "Red Devil". Still had the piece of paper on the window that said "NOT FOR SALE" and his sunglasses on the front seat. Local car since new in Tacoma area. EXTENSIVE service and maintenance records dating from 1971 - 1988... Everything in receipts from tires and light bulbs even to when the engine was rebuilt circa 1984. A tip to everyone else -- always stop and talk about old cars to neighbors, you seriously never know how it will turn out! Oh, did I mention the floors are totally (yes, totally) solid!!!! Too late! I just bought it! How much are you going to ask for it on Craigslist after you wash it up and air up the tire ?? Incredible survivor. Stopped and talked to the old lady who owns this for about an hour and a half! She said a small amount of cash takes it and the title! 1965 L320, 4 speed on the floor. It was originally her father's truck who owned it 'til '76(?) when he passed away, and then her husband kept it in storage at the in Tacoma, WA for many years. Finally brought it home and then he just passed away last year. She said it needs to go to a loving home because there are too many precious memories with it. Still had the piece of paper on the window that said "IS NOT FOR SALE" and his sunglasses on the front seat. Local car since new in Tacoma area. 45,000 original miles. Practically mint interior. Needless to say, I'm thinking I'm going to buy it. I can't believe I'm lucky enough for this lady to show me all of her late husband's old tools and toys. Very nice lady. lol, girlfriend told me if I buy it I CAN NOT sell it! That she had to tell you this makes me sad. That 320 looks mint! Aside from the small ding below the left headlight, that is. Quit kidding around and get it, would ya? 64 grille; floor shift. Must be late 64 - very early 65 build; or converted to floor shift in it's short 'working' life?? Interior Oics, Please!! Nothing trumps a survivor; with verifiable history. Nothing, nearly. Never say 'Never',,,, or 'Nothing'. Cover Ur Nutz. At any rate, I'd be proud to have her stable with my varied collection of odballs. I'll check the production date next time I swing by. Thanks for the info, though! But seriously, the time to buy it is when you see it. There is no production date on old rigs. 320 ID tag has a stamped year, which is stamped long after the production date. The first concern that I have, though, is of course the engine. It is an old E1 and while I've read that parts cross from some MG(?) and BMC(?) engines, it seems like it may be a bit of a chore to rebuild it. This is just my first thought, though. Which brings me to thinking about swapping the E1 for an A series engine. I've been searching around Ratsun and the internet in general and I think I read that Wayno had an A swapped 320. Does anyone have any additional info on this swap? 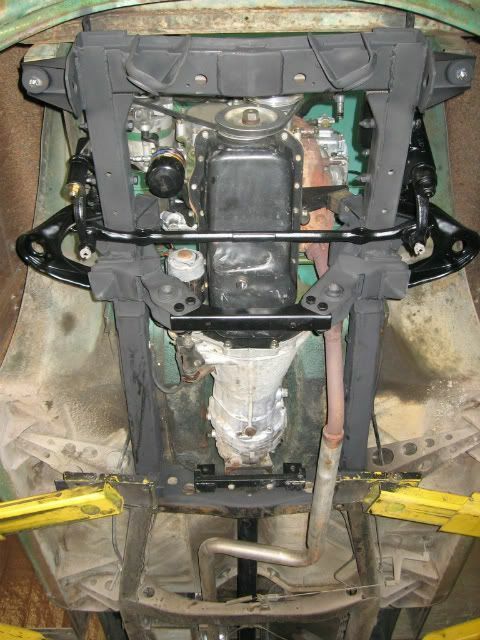 transmission tunnel and crossmember - tight fit and custom crossmember will need to be built. Other than that, it's an awesome engine for that truck and it looks right at home. What about oil plan clearance vs. the crossmember? Hate to be spoon fed, but thanks again for the info. I'm pretty sure that any Datsun trany except one originally used in the 320 will require a floor cut at the rear of the trany floor opening for the shifter to sprout up through. Shifter will also be right at the front edge of the seat. The 320 floor shift & early 520 transmission (same trany till Sept. 65) shifter sprouts in about the center of the tailshaft housing. I believe all the others are at the very back of the tailhousing; about 5" difference. 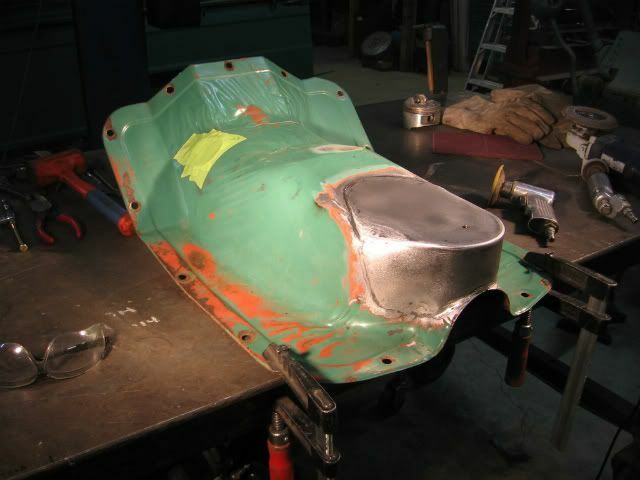 A different floor pan is also required for the original floor shift trany. It's has a taller hump and a hole for the shifter. I studied this in depth about a year ago. I lusted after a 5-speed but didn't want to cut the floor. I know that there are some pickups out there with A-Series power, and I'm sure that some are done right. I do have a photo of a pickup with the floor cut crudely, but I can't attach it from work. Maybe tonight. You will have to fab motor mounts and an oil pan. I take the stock pan, cut the sump off, turn it around and weld it back on. Yes, I used a "dogleg" 5 speed in my green truck and the shifter came right up to the front of the seat while in 1st, 3rd and 5th gears, but it did fit. I eventually got around to making a console for the shifter. You may not be able to see it, but this is a modified oil pan on an A12 in a 320. I also notched the top of the crossmember about .500". Thanks, Stoffregen, I'm archiving your photos. Sure. I've got a ton more in my files and a few more on my Photobucket page. If you go there, there is a Datsun folder and a 320 subfolder, kind of a mess really. You might be surprised by the E-1. Some of the parts are readily available, some not. But the easiest thing may be to get the stock engine running. Everything I've read and my experience to date is these are very bulletproof little engines. IF you buy the truck, see if the engine will turn by hand. Remove the spark plugs, spray in some WD40, and use the hand crank through the front grille and you may be surprised to find the engine is free. 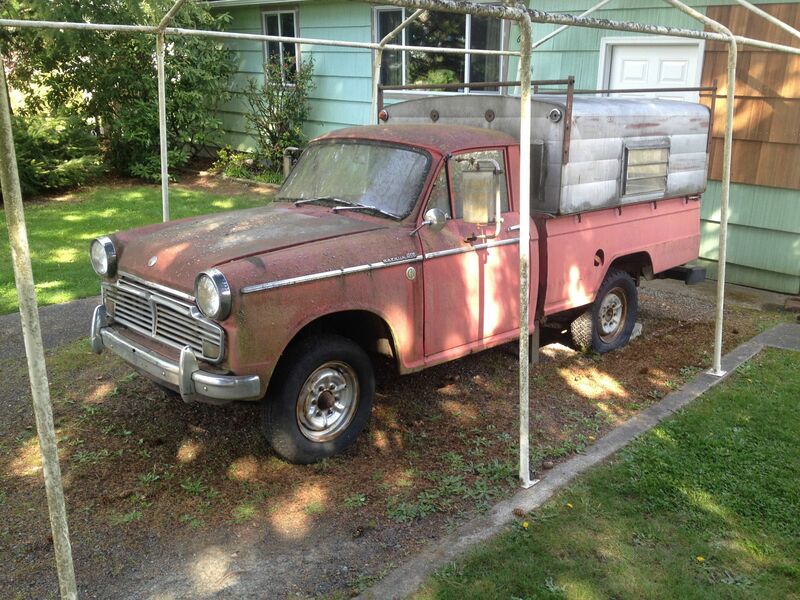 If this is truly a low mileage truck a rebuild may be totally unneceesary. Seriously, thank you all for the useful info. I love Datsuns but this 320 is ancient by comparison of the run-of-the mill L series Dattos.